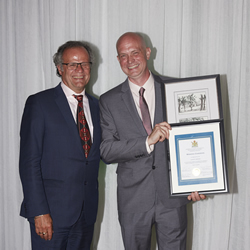 In 1967, the Stoney Creek Chamber awarded its first Citizen of the Year Award. Since then, the recognition has been expanded to recognize great citizens and businesses that have distinguished themselves with outstanding contributions to our community. Every year, a wonderful Gala is held in honour of the award recipients. The Citizen of the Year award is presented to an individual who continually gives of themselves and helps many others in the process. 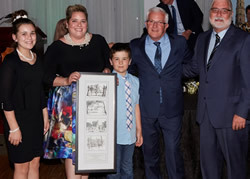 Their outstanding contributions to Stoney Creek in community service and volunteering define excellence in character and contribute to improving the lives of our citizens. 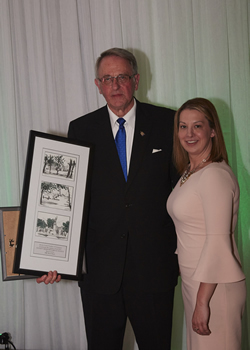 2017 Winner – Tom Busch – Award sponsored by Donald V. Brown Funeral Home Ltd.
Citizen of the Year Tom Busch being presented his award from Julie Brown and Craig Brown (and family) from Donald V. Brown Funeral Home Ltd. The Junior Citizen of the Year Award is presented to a young person for their outstanding contributions to the community, and within their school. 2017 Winner – Lucia Marchiondo – Award sponsored by The Stoney Creek News and Lions Club of Stoney Creek. 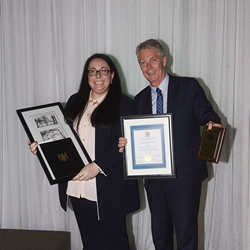 Junior Citizen Lucia Marchionda posing with her awards with Mayor Fred Eisenberger. The Business Achievement Awards include the Outstanding Large Business Achievement Award, Small Business Achievement Award, Legacy Award, and Community Recognition Award. Ultimately, these businesses make Stoney Creek ad the surrounding communities a better place to work, live, and play. Anthony Stayrer of A.S. Security being presented with the Outstanding Small Business award from Ron Barry of Bertram & Barry Insurance. The Outstanding Large Business Achievement Award recognizes outstanding local businesses and is presented to a company that stands out in our community as a leader. This company demonstrates outstanding business practices, excellence in community relations, sustainable growth and quality customer service. 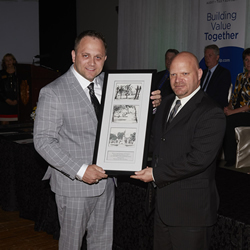 Terry Kotwa of Tiercon Corp. being presented with the Outstanding Large Business Award from Norm Schleehahn of Hamilton Economic Development, City of Hamilton. The Legacy Award is awarded to a business that has a longstanding history in the community. 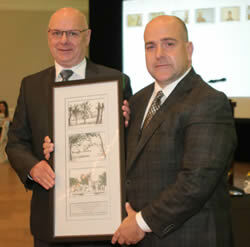 Jeff Beattie of Winona Gardens being presented with the Legacy Award from Bennie Esposto of Fuller Landau LLP. The Community Recognition Award is awarded to an organization (charity or not-for-profit) which is highly regarded for raising funds or providing services, making a positive impact and improving the lives of people within the community. Thank you to our Award Sponsors: Fuller Landau LLP, Bertram & Barry Insurance, Hamilton Economic Development, Donald V. Brown Funeral Home Ltd., RBC Royal Bank, Stoney Creek Lions Club and Stoney Creek News. Thank you to our Reception Sponsors: Hamilton Tiger-Cats, Smith’s Funeral Home Stoney Creek Chapel, Tripemco Burlington Insurance Group Limited, McHugh Whitmore LLP Law Firm, Southbrook Golf & Country Club, ActionCOACH Business Coaching, and Winona Vine Estates.